The 2nd Co. Governors Horse Guard in Newtown, CT hosted a combined drill with their guests from Avon, CT, The 1st Co. Governors Horse Guard. 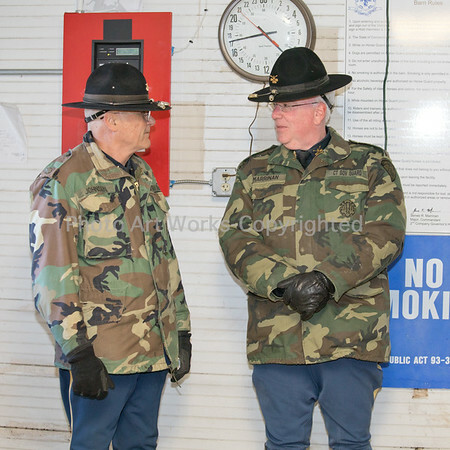 Due to the wind and very cold temperature on this March 2018 day drill was held in the indoor ring with the 2nd Co. riding first, followed by the 1st Co. Prior to drill 1LT Julie Baily from the !st Co. presented 1LT Paul Mazzara from the 2nd. Co. and his father CPT Robert Mazzara from the 1st Co. with photo plaques. The plaques featured the father and son leading each of their respective companies at the Battalion Review in Hartford, 2017. Photos also include the new supply room built by CPL Freer and his son Steven. After drill a delicious corned beef and cabbage dinner was served in honor of St Patrick's Day.